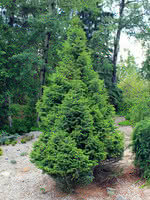 Serbian Spruce is a medium-sized evergreen. Even in the absence of competition, Serbian Spruce has a slender form. It is commonly used as an ornamental tree due to its columnar shape. Serbian Spruce can grow on a variety of sites, but it prefers moist drained soils.